Christmas is coming which means getting out the christmas jumpers, mulled wine and festive spirit. This week I went to London’s biggest Christmas event, Winter Wonderland in Hyde Park. Entry to Winter Wonderland is free and there are plenty of fairground rides, Christmas food and wine markets and even a Santa’s Grotto. 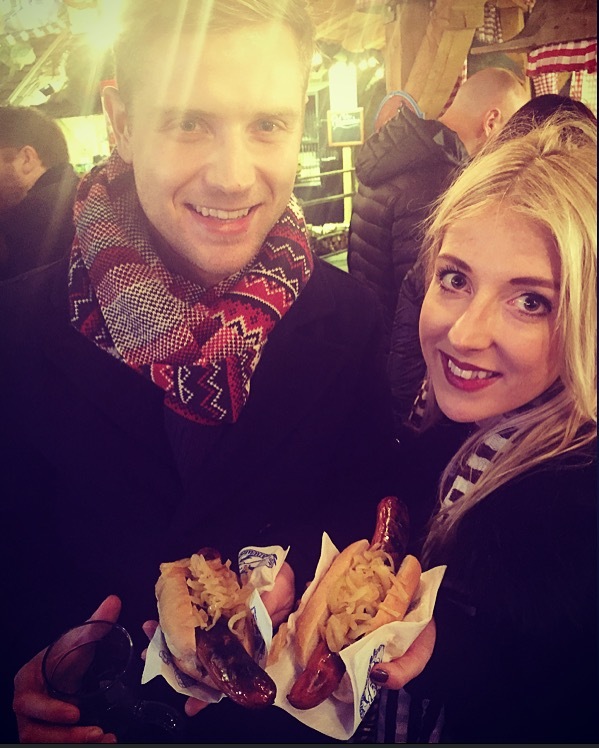 I went along with two of my old friends, Kieran and Lauren and had a great catch up over a cup of warm mulled wine and traditional German Bratwurst. This year, the mulled wine was an unusual cherry wine made and decorated with real cherries. Warming and delicious. We spent most of the evening around the “Bavarian Village” area, a popular area for traditional German meat and beer. It was a great place to hang out as it has an authentic German Christmas feel – German food, steins and music. Every year an enormous sculpture stands in the Bavarian Village and this year the stage was set for an enormous Bavarian man apparently talking to an equally enormous bird. Whilst a bit of fun, the man’s face did sport a relatively menacing stare. Winter Wonderland is characteristically more of a Christmas funfair than a market and, as usual, the rides were in full swing. They are fantastic fun if adrenaline is your thing, even the smaller ones. All in all, Winter Wonderland is a great day/evening out and wholly recommended. It is open until the 3rd January. If you haven’t been this year then make sure you take the time to make a visit, even a short one!